Yes, there are mountain boomers in Illinois! While they are not known to be native to this state, a few were introduced into Johnson County, perhaps in the early 1990s, and have established themselves. The latest rumor is that the Illinois Department of Natural Resources may be capturing them to eliminate them from the state since they are "exotic." The original locale of these mountain boomers was apparently Missouri, and the individual involved in their translocation was subsequently convicted of violating the Lacey Act. 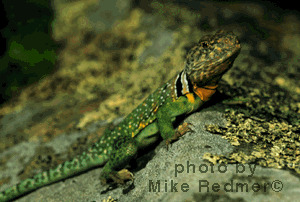 (This information is from a woman at Southern Illinois University--Edwardsville who was studying this population of collared lizards, and from the Illinois department of Natural Resources--provided "third-hand" by Mike McCambridge who supplied one of the mountain boomer pics on the Oklahoma page). This photo of a male was taken in Johnson County by Mike Redmer, professional photographer, and used with permission.